The history of the cockroach is one of natures greatest success stories. Roaches are among the oldest living things on the planet --- literally older than the hills. Over 300 million years ago the Appalachian Mountains and the Alps were rising --- and the roaches were there. Roaches are remarkable survivors. They can go weeks without food or water, and they have adapted to conditions in nearly every corner of the globe. (5) the most wide-spread of all, The German cockroach. Roaches transmit at least 13 human diseases, usually by contaminating food through simple body contact or through their saliva or excrement. Their calling cards include common food poisoning as well as typhoid, dysentery, hepatitis, allergies, and leprosy. Roaches may be found in restaurants, office buildings, and your home. 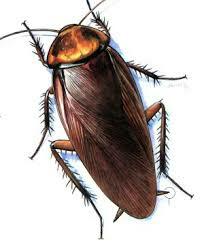 If roaches do get in your home, you can make an undesirable environment for them by keeping your home neat and clean. Don’t let trash pile up and provide breeding and hiding places. Store food in containers which cockroaches cannot penetrate. And don’t feed roaches by letting crumbs accumulate around dining or food preparation areas. However, though these steps will discourage roaches, they cannot eliminate them. To stamp out roaches, and keep them out for good, you’ll need the help of our Professional pest service; we can prescribe a treatment and/or a program that will keep the roaches away.